This is one of the locations we did a hot stop with the chopper. Basically the pilot keeps the engine running, you jump out, compose, shoot, compose, shoot, jump back into the chopper. We were looking for a water shot and there was one near here but with fishermen so we decided against disturbing the peace and landing in this field about a mile away. I immediately gravitated towards this lone tree which seemed to be the sentinel between the regions of the valley. I think to an observer it would have been quite the sight; landing, jumping out, running, shooting and taking off. Yeah, just another day at the office. Obtain a high quality canvas print for your office. This gentleman had a bag of groceries and was heading back to his boat for the evening. I think when you anchor offshore you have no dock fees, no rent, only groceries and living expense. Sounds like a simple life. I’d probably go crazy without modern conveniences, but I’d still try it for a week or two. I’d get through a few more books and have more time to think about what’s important to me. Even if I can’t be isolated on a boat, I should probably do that anyway. Obtain a high quality print for your home or office. Go outside your element and obtain a high quality print. Last summer I went to Banff in Alberta and captured this walking bridge over the Bow River. Recently I got back from New Zealand. Now I’m conflicted as to which one I liked best. That’s impossible to answer so let’s just fuhgeddaboudit. But if there was another place on earth as beautiful and either of those I’m not sure what I’d do. That’s the problem with being a photographer. Good problem to have I suppose. And I have a sneaking suspicion there could be other surprises in store, …like maybe Iceland? One day. Nothing wrong with dreaming. Obtain a print of Banff. Or New Zealand from my portfolio. You decide. On the weekend we took a drive to the east coast of Florida to see what we could see. A little more than halfway we stopped at Lake Placid for lunch. Picked up lunch at a friendly little diner and then found the public boat dock for a picnic by the water. Later I learned that Lake Placid has a clown college, …okay? So if you’re afraid of clowns you might steer clear, …I’m just sayin. Other than that this sleepy town seems like a nice enough spot and a good place to put your feet in the water to cool off from the Florida midday heat. And besides, the only clowns I saw were these waterfowl playing in and amongst the reeds. Don’t clown around and obtain a fine art print for your home or office. Couple of weeks ago I drove up to Shannnon Falls from Vancouver. At over a thousand feet the falls are too big to capture from the ground, at least for me. Just a short walk off the road you can stand within a few feet of this massive spectacle. And this is only the third largest fall in the province. On this afternoon I walked along the trails under the thick canopy of evergreens with the cool mist wafting from the falls. Something about this is rejuvenating because I left with more energy than I came with despite having traveled from Florida earlier in the day. Obtain a rejuvenating print for your home or office. 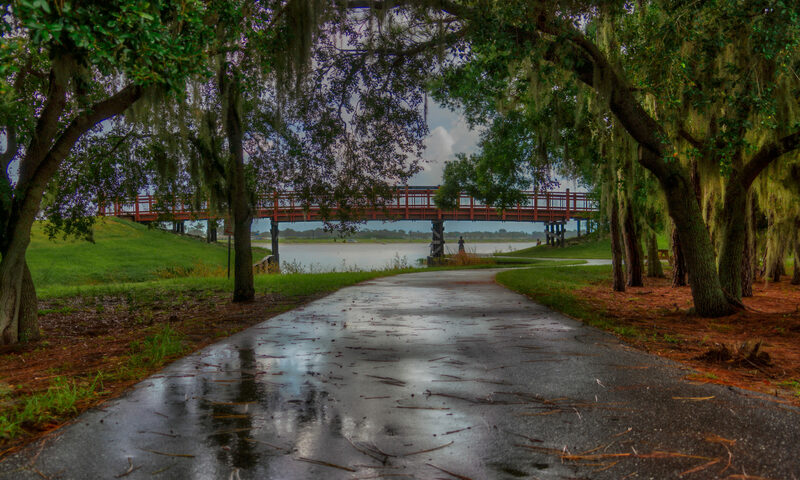 The path around the pond at Neal Preserve in Bradenton Florida. One of my favorite places to watch the local birds and take in the lush landscape of central Florida. I’ve been traveling so much lately and am overdue for a visit in my own backyard to one of my favorite spots. A couple of weeks ago we stopped in Half Moon Bay and walked the beach at sunset. The beaches, waves and landscape of the Pacific are so much more dramatic than the west coast of Florida where I live. Even though I grew up in California, now when I return it all seems so new and interesting. Perhaps the same is true the other way around, each is unique. In any case, in the states we have a long weekend ahead so maybe I’ll head to the beach again, there’s always something fun there. Have a wonderful weekend everyone. Last week in Vancouver I stopped at Ambleside Park on my way back to the hotel. It was late but I couldn’t pass up an opportunity to get the full moon behind the bridge. I climbed down a rock and concrete barrier in total darkness to get my camera down close to the still waters of the bay. I started shooting and saw a ship approach the bridge. Perfect; a bridge, a moon, a ship; elements for a composition. From the ship’s bow I couldn’t tell how big it was as it slowly approached head on, then it turned slightly to head out to sea. It went under the bridge and I began to see it’s profile, much bigger than I thought. As it came alongside I realized it was some type of a super-massive cargo ship, maybe seven hundred feet or longer. I watched in stunned awe as it passed slowly in the night with the low sound of the engines, hardly breaking a wake. Hardly. About a minute later the glassy still water started to move and large low frequency waves began to wash on shore. In effect a mini tsunami. The sound of the wave breaking along the entire length of the shore broke the silence as I grabbed my tripod and jumped for higher ground. Let’s just say I was a little lucky. Perhaps there was no harm, but I left there a little shaken from the ordeal and wondering if I had let my enthusiasm overpower my better judgement. Obtain a high quality print, it’s completely safe. Can you keep a secret? I think I may have discovered the end of the rainbow. I’ll be going back to find the pot of gold, but at least I know where it is. Well, actually I have no idea where this is, other than somewhere in Mount Aspiring National Park close to Mount Earnslaw in New Zealand. Flying through the southern range we experienced microclimates at every elevation and terrain. When we started in the morning up at elevation it was ten or fifteen degrees below freezing (with the helicopter doors off by the way). By the time we got back four hours later it was in the seventies. I was so busy concentrating on my camera settings that I forgot I had this image until last night when browsing through. Anyway, don’t tell anyone. Obtain a print for home or office so you too can find the end of the rainbow.